WILLEMSTAD - The vice president of the Venezuelan state oil company PdVSA, Asdrúbal Chávez is in Curaçao today for a quick visit. 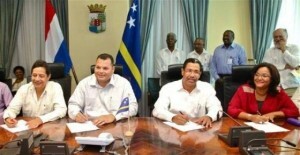 Chávez will, as was confirmed by the refinery’s spokesman Kenneth Gijsbertha and Angelo Meyer, president of the refinery workers’ union PWFC, meet with Prime Minister Ivar Asjes to cosign the long awaited Memorandum of Understanding (MoU) on the future of the refinery. In the declaration of intent, PdVSA and specifically Refineria di Kòrsou (RdK), the owner of the refinery agree to talk about the future of the refinery. The document fits into the vision of the government to start looking, together with the Venezuelans, for a third partner, which can make the necessary investments, which in turn will guarantee the future of the refinery. This option is preferred by the Curaçao government when the lease with PdVSA expires in 2019. The PWFC Chairman Meyer was very enthusiastic this morning about the upcoming signing. Along with Apri, the union for top personnel of the Isla refinery, the PWFC, in its own words, lobbied behind the scenes to see this MoU crystallize. Meyer described the signing as something big for Curacao.